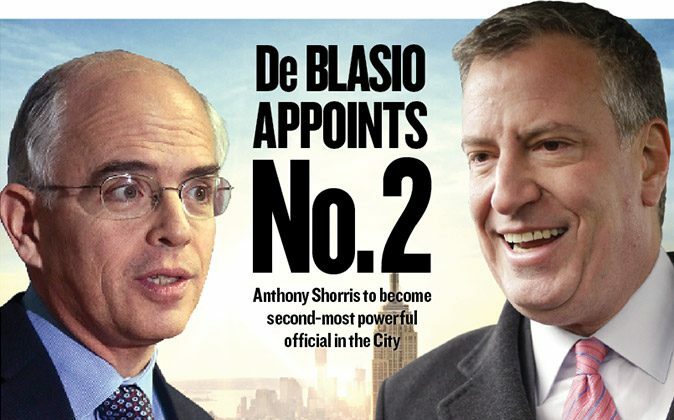 Anthony Shorris (L), first deputy mayor, and Bill de Blasio, New York City mayor-elect. NEW YORK—Mayor-elect Bill de Blasio introduced the city’s future second-most powerful man Wednesday, picking an experienced government hand and making clear that his administration will be structured differently from Mayor Michael Bloomberg’s. De Blasio appointed Anthony Shorris, a man with 30 years of managerial, academic, and policymaking experience, as his first deputy mayor. Shorris will serve as the second-highest ranking official at City Hall, and will be responsible for managing day-to-day operations. While the police commissioner and the schools chancellor will report directly to de Blasio, Shorris will oversee all other departments. The appointment signals a shift in government structure from that engineered by Mayor Michael Bloomberg. The position of first deputy mayor was less central during Bloomberg’s administration, with deputy mayors reporting directly to the mayor, not the first deputy mayor. The organizational chart of the Bloomberg administration looked more like a corporation, with the departments working more autonomously. De Blasio said Wednesday that he wants to streamline government and establish clear lines of authority. The mayor-elect has long felt the need for a first deputy mayor, saying his convictions come from his analysis of four administrations. De Blasio reiterated that he will be a hands-on mayor making a lot of the decisions, but Shorris will be his right-hand man. The mayor-elect highlighted Shorris’s long résumé, which includes 30 years of managerial, academic, and policymaking experience, including stints as deputy budget director and finance commissioner under former Mayor Ed Koch, and deputy schools chancellor in the early years of the Bloomberg administration. Shorris also served as executive director at the Port Authority of New York and New Jersey, directed Princeton University’s Policy Research Institute at the Woodrow Wilson School of Public and International Affairs, and acted as a senior vice president and strategic adviser to the dean and CEO at New York University Langone Medical Center. “I don’t think I know anyone who has this range of experience and achievement, and who will be able to work with all elements of the government seamlessly,” de Blasio said. De Blasio in particular credited Shorris as the “central architect” of the Koch administration’s affordable housing plan. De Blasio referred to the achievement of 200,000 new units “stunning,” and said he hopes to mirror it. Shorris will also be charged with helping to negotiate new contracts with the city’s unions, de Blasio’s first significant fiscal dilemma. The unions have been working on expired contracts for years and want retroactive raises that could total more than $7 billion, a figure most analysts believe the city can’t afford. Dominic Williams, who was de Blasio’s chief of staff in the public advocate’s office, will serve as chief of staff to Shorris in the new administration. De Blasio appointed Emma Wolf the director of intergovernmental affairs. Wolf also worked in the public advocate’s office with de Blasio and was his deputy campaign manager. Wolfe will work with officials at the city, state, and local levels to lobby for de Blasio’s progressive agenda. Wolfe’s first priorities will be to secure stronger living wage and paid sick leave bills in City Council, get approval for a tax increase in Albany to pay for de Blasio’s signature pre-kindergarten plan, and ensure the city gets federal funds for infrastructure and Superstorm Sandy relief. NEW YORK—Zakiyah Ansari is an outspoken advocate for public schools and the loudest voice of education on Mayor-elect Bill de Blasio's transition team.